LANSING, Mich. (AP) — New Michigan Gov. 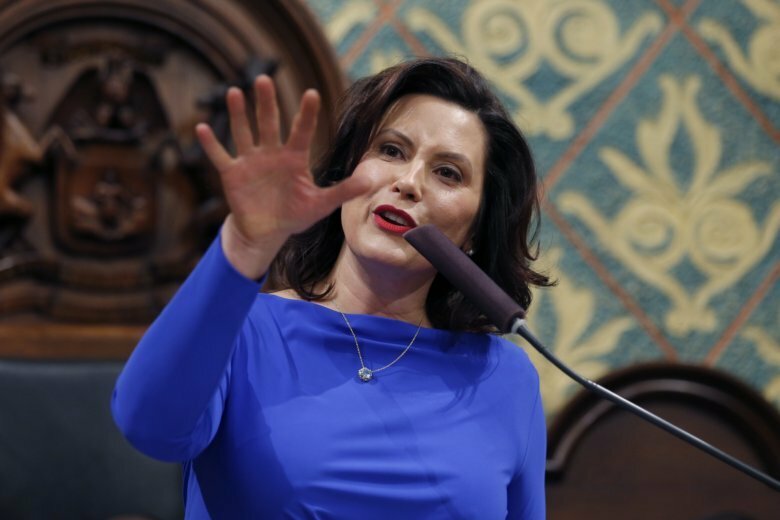 Gretchen Whitmer, who campaigned on a bold promise to “fix the damn roads” in the capital of the U.S. auto industry, will propose nearly tripling the state’s per-gallon fuel tax, her office said Monday. The Democrat’s budget proposal, which will be a tough sell in the Republican-led Legislature, would boost the 26-cent gasoline and diesel tax by 45 cents by October 2020. The tax hikes would coincide with relief “to help offset the cost to people’s pocketbooks,” which Whitmer will discuss further when she presents her spending plan Tuesday, said spokeswoman Tiffany Brown. She wants to boost the 26-cent gasoline and diesel taxes by 15 cents in October, an additional 15 cents in April 2020 and 15 more cents in October 2020. That would generate an additional $2 billion annually. She has said drivers already are paying a “road tax” because Michigan’s pothole-ridden roadways are forcing them to pay hundreds of dollars a year on vehicle repairs. Business Leaders for Michigan, a group of the state’s top executives, on Monday urged legislators to act. President and CEO Doug Rothwell stopped short of backing a specific proposal but said the roads “are an embarrassment,” are getting worse and becoming more expensive to fix. Michigan drivers pay some of the country’s highest taxes at the pump, but not all of the revenue goes to the transportation budget. The sales tax on fuel mostly goes to schools and local governments under the state constitution. Whitmer also will call for new “weighted” K-12 funding formula to factor in higher costs for certain students, according to details first reported by The Associated Press. The plan includes $235 million in additional base aid — a 2.5 percent bump — along with $120 million more for special education, an extra $102 million for economically disadvantaged and other at-risk students, and $50 million more for career and technical education students. Whitmer’s administration is billing it as the largest increase in classroom spending in 18 years, if state payments for retirement costs are not counted. It was not immediately clear how she will propose paying for the plan, though she has previously called for stopping the practice of shifting K-12 funds to universities and community colleges. Her plan was applauded by the Michigan Education Association, the state’s largest teachers union, which called it a “huge step” toward addressing how education has become underfunded over decades .